OLD PARKED CARS. : 1987 Chevrolet Sprint Turbo. Hi Joey, it just feels safer being more visible (often have the family with me). They shut off with the car too, which is nice. never heard about these--are they good? probably accelerates like a rubber band, just by virtue of its weight. you'll need 8 bolts just to keep the wheels on a beast like this. thanks for the off-center scoop detail. 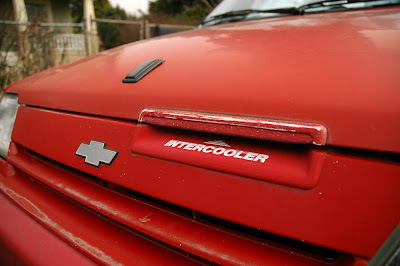 I wonder how often the intercooler slot is mistaken for a mail slot. Snow? In Portland?! Lies and slander! Hopefully they didn't put much salt on the roads. Love the turbo Sprints. Esp. in white. Those wheels really set it off, so glad they're all intact. Not sure if I'd be embarrassed to drive one or not, apparently they could be quite fun and get ridiculous mpg. I'm sure at the time they were received like the new Mini Cooper S was. I'd love to experience a curb weight of 1650 pounds, even if it is FWD. 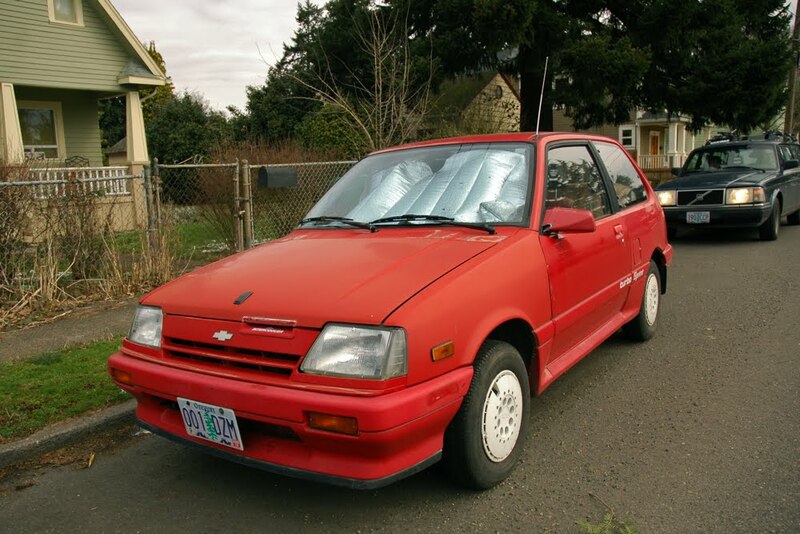 This one grabbed me as looking particularly fun to drive, if ugly. I love how the slot for the intercooler is labeled. It adds a more quirky aspect, which I like. certainly a "trip" when you see your own car on a blog. 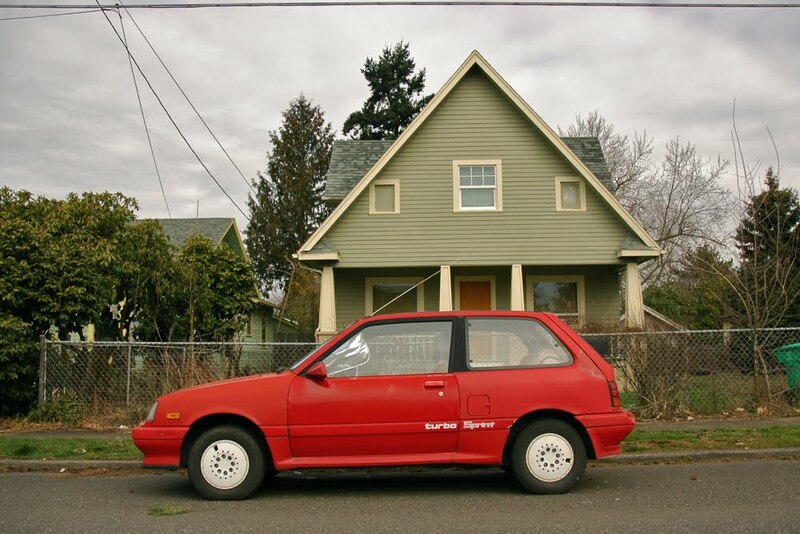 that is my 87 Sprint Turbo, owned since 92. Great car, quick, reliable, crazy gas mileage, I cannot complain. I need to get it detailed and have the driver's seat re-foamed/new fabric. Know a good shop for this? I'm getting more and more jealous of this car Kenny. I'm sure you get asked this all the time, what's the best mileage you've gotten, and what kind of mileage do you get when you drive it hard? Personally, my cars have never been nice enough to justify the cost of re-upholstery, when (often more comfortable/supportive) replacements could be found for $20 or less at the junkyards. ti really has to be the most fun and unique car to own and drive I have ever experienced. I bought it in 92 and have loved it ever since. Spent it's 1st 15 years with me in the bay area. I get 47 mpg on the highway, sometimes over 50 if I stay at 50 mph (easy in OR usually). 57 was my highest. Combined with city it falls to about 36-38 MPG. This thing FLYS! Yes, Kinch... I sold it. A gentleman in L.A. flew out and drove it back to L.A. in October. 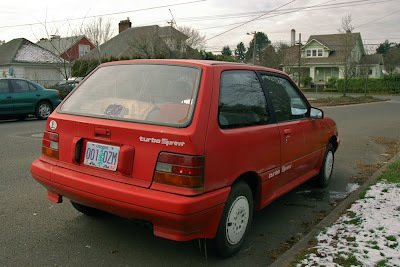 I owned it since 93' and it was the funnest car I have ever driven. I hope he calls me if he ever sells it, we shook on this but I am always a skeptic. Those were really preppy back in the days. Not fast, but preppy for a 3-cylinders!